We eat pasta at least once a week and, often, it is an emergency meal. We get home late from something and throw some frozen filled pasta in boiling water and mix through some bought pesto. Proper lazy food. But then there are occasions (all the time, really) where there is no excuse for such laziness. As Susan, at the Well Seasoned Cook, is hosting Pasta Presto Nights this week I took this as an opportunity to NOT crack open a jar but instead use up what was in the fridge. Fortunately, the fridge was well stocked for pasta making. 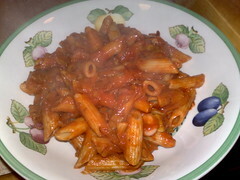 We had half a jar of passata – absolutely essential for a fast pasta sauce, as well as half a small pot of tomato paste. An excellent start. If you’re using dried pasta, start cooking it before you start on the sauce. I started by heating some olive oil in a pan, and crisping up a couple of rashers of bacon, chopped up. Then I added a roughly chopped leek and 3 minced cloves (large!) of garlic. Once the leek had softened, in went the passata, and I rinsed out the jar with some of the red wine that was open. Then I mixed through the tomato paste, and added a teaspoon of oregano and a tiny scotch bonnet chilli (the first of what is looking like a very large harvest), very finely chopped. And I just let that all very gently simmer while the pasta cooked. Shortly before the pasta was ready I stirred through the remnants of some mascarpone (probably about 75g worth). Mix the pasta through the sauce, and serve, topped with plenty of parmesan and black pepper. From start to finish, this took less than half an hour (in fact, the sauce was finished before the pasta had finished cooking) and it was absolutely delicious. The tiny chilli added a lovely background heat that built up as we ate and the mascarpone and tomato paste both enriched the sauce and made it fabulously creamy. The only problem? We don’t always have a fridge so conveniently stocked for pasta sauce making! Hullo, Alex! So good to see you. I remember you well at Eating Leeds. Thank you for the great PPN dish. When you start with passata and tomato paste, I can only dream how richly tomato-y this is! It was gorgeous & rich – which is great because it’s starting to get cold here! Just don’t forget to add mascarpone or cream! What a wonderful fridge full of goodness. I love the addition of leeks to the sauce. Thanks for sharing with Presto Pasta Nights. Now I’m off to stock up my fridge! Ruth & Claudia – I just wish our fridge was as well stocked all the time! The Food Hunter – yep – comfort food perfect for cold winter nights! Some of those “cleaning out the fridge” dinners are just the best. I love your combination of things in this dish.